In today’s busy world we may not get a chance to manage our websites at a consistent basis like we would like to. For a business or a marketing avenue a constantly updated and active website can make a difference for maintaining and drawing in new clients or customers. Taking advantage of learning how to schedule your posts automatically with be very helpful to your time and your online blog. So what can we do as an alternative to help manage our websites with such busy schedules? WordPress offers a great tool such as other webpages like Facebook does. Besides being able to schedule your post on your website you can also perform other useful actions. WordPress also allows you to perform actions after your posts have been published. You can close comments, set sticky post, and delete post at scheduled times. By downloading Scheduled Content Actions Plugin you can perform other useful actions with already published posts as well as work with the scheduled post WordPress allows by default. This great plugin allows you to preform many actions a few are delete post, close comments, unstick post, delete term, and etc. Besides this add on you can still do the basic scheduling of post for your webpage. This is a simple process through WordPress and can allow users to have post prepared and ready months in advance. Some of us aren’t that organized, but perhaps a day or so ahead can be useful as well. What are some other benefits does scheduling your posts do for you? Let’s say you are in a different time zone and your peak viewers are I times not convenient for you by scheduling your post you can still meet those peak hours for your viewers that you may have otherwise missed with your time zone. Another event could be that you are ill or on vacation and don’t want to abandon your blog by posting in advance you can avoid leaving your blog for days or weeks and keep the activity up to date. So how do you schedule ahead for your post? 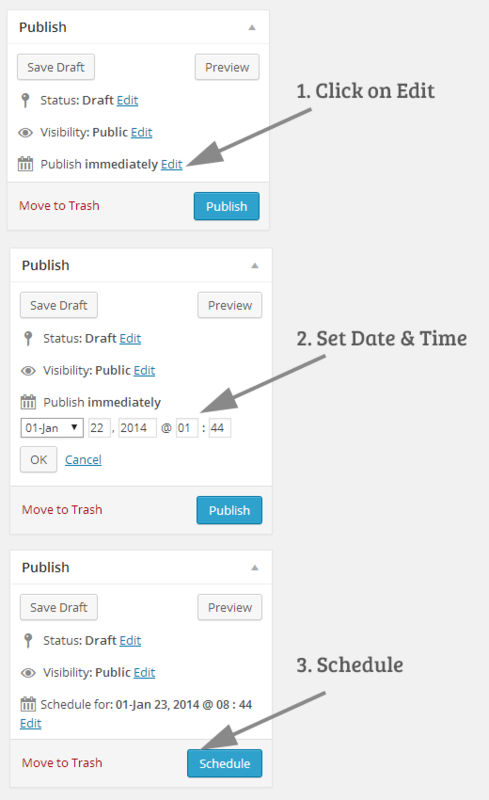 There is a publish box that pops up when you are done writing your post before clicking publish immediately there is an option to input a date and time instead. From this point you can schedule as many post as you’d like in as far advance as you would prefer. This is great option to take advantages and a lot of new WordPress users have no idea about it. If you find yourself running out of time during the week be sure to take advantage of this useful tool and if you would like to add extra plugins and useful tools to pre schedule as well then research the plug in options there are a few out there available for WordPress with some of the options listed here. There is a world of opportunities for your website through these plugins and tools through WordPress and every useful tool can make a world of difference when it means the success of your page and more time on your hands. The more time you have to devote to your business the better and WordPress gives you that chance with any features and plugins to choose from that offers WordPress tips and tricks.